These DVI cables are of professional quality, often supplied with high-end multimedia projectors. 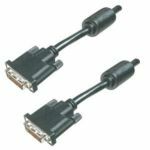 Perfect for connecting your PC with DVI connector to LCD screen, plasma display or projector. As you would expect from a professional quality product, the pins are gold plated, and the cable is fitted with anti-RF interference ferrite rings at both ends.